JCT600 has begun a £1 million redevelopment of its Volkswagen car dealership in Saxon Way in Hull, as part of an ongoing programme to enhance the company's dealerships. The 11-car showroom will be overhauled and expanded to 400 square metres — around double the size of the current facilities. The refurbishment will remove all desks and replace them with ‘comfort zones’, cafe areas and leather sofas. There will also be interactive touchscreens, a customer quiet zone and a business lounge. 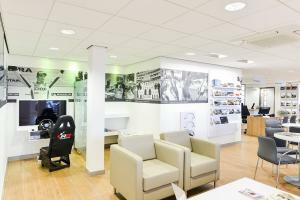 And to keep children amused, JCT600’s kids area will feature a gaming station and a fixed iPad. Mark Taylor, group property director of JCT600, said: “Volkswagen is at the forefront of blended retailing, known as 'bricks with clicks', which embraces the latest digital technology and incorporates it within its dealerships while also appreciating the continuing importance of face-to-face contact. While the work is being completed, the Hull dealership will relocate to a temporary area in the car park, with the newly revamped facilities scheduled to be open for business around mid-April.